This week we've got Fortnite front and centre, but the battle royale has dropped another 4 per cent in views this week. League of Legends comes in second place after also dropping 3 per cent of views. 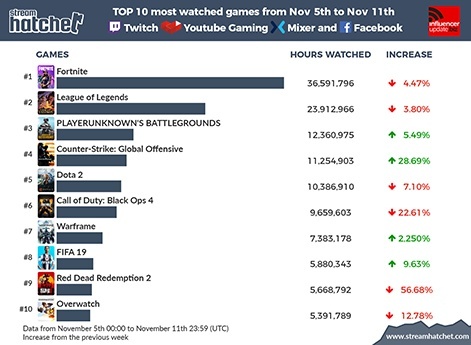 PUBG has enjoyed a surprising climb up to third place with a 5 per cent increase in views. CS:GO isn't far behind after experiencing a 28 per cent increase in views this week. The CS:GO Intel Extreme Masters Chicago tournament came to an end this week which could be responsible for the game's surge in views. Dota 2 comes in at number 5 this week, and Call of Duty: Black Ops 4 is in sixth place after a 22 per cent drop - the title's lowest position on the chart since it launched in October. 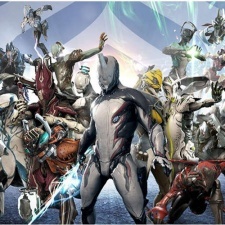 Warframe is a surprise entrant this week, with an absolutely whopping 2250 per cent increase in views this week. While we're not completely sure what happened there, the F2P shooter released a new expansion last week and a few big Twitch streamers have picked it up. As of writing, the game is currently the fifth most popular on Twitch. FIFA19 is number eight this week with a 9 per cent increase in views. Red Dead Redemption 2 has experienced the largest drop in views; the rootin' tootin' adventure has had a 56 per cent decrease in views. Overwatch is still clinging on to the chart top 10 after a 12 per cent loss in views since last week. Blizzard's FPS multiplayer enjoyed a surge in views last week after announcing a new hero, but interest seems to have settled back down.